I recently participated in a writers’ workshop at the beautiful Ragdale Foundation. The workshop was called, “Shut Up and Write,” and focused on the practice of silence as part of a writing life. It was sponsored by Story Studio Chicago and presented by author Anne D. LeClaire. In her book, Listening Below the Noise, LeClaire shared her experience of incorporating days of silence into her life. For the past eighteen years, she has spent the first and third Mondays of each month in silence and she described how it has impacted her writing and her life. At the workshop, we alternated classes, writing and sharing with blocks of silence. Silence was observed from the end of each evening workshop until after breakfast the next morning. It’s amazing how loud the crack of an eggshell at breakfast can seem in an atmosphere of silence! Back at my desk that first day home, I was still processing my experience when the ring of the telephone startled me and broke my concentration. As usual, I was irritated by the interruption. I seldom answer that phone anyway during the day because it’s either a sales call, a survey or some other call I don’t need. There and then I made the decision to remove the phones from the upstairs of the house. I pulled out the one in my office and the one in the bedroom and sat back down to work. Not long after, I heard a phone ringing in the distance. Not as startling as the one on my desk, but it was still enough to break my concentration. I went out in search of the phone and found one in the spare room. Out it went. I’m surprised by the relief I experienced with that decision. I’m no longer startled by nuisance calls when I am deep in concentration or engaged with a business call. My argument used to be that I needed to be accessible for emergency calls any time but now the people who need to reach me will call me on my cell phone first, anyway. 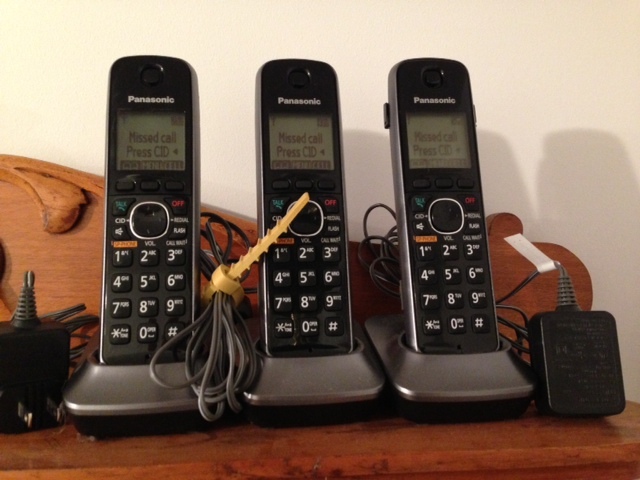 I did leave the kitchen phone in place because I still like the identity associated with having my home telephone. It’s my account number for the cleaners, the pizza place and any of a number of loyalty programs. I know I’m not ready for one complete day of silence, let alone one every two weeks. But I am starting to incorporate periods of silence into my life. Getting rid of those phones was my first step! This entry was posted in Family, Home, Personal History, Traditions, Uncategorized, Working at home. Bookmark the permalink.